It’s been two years since Jennifer Olansen was in Rebekah Pignaloso’s social studies class, but she hasn’t forgotten the positive impact the sixth-grade teacher made on her and others. “I always remember her being so nice to everybody and always wanting everybody to do their best and trying to help them succeed no matter what,” Olansen said. That is why Olansen, an eighth-grader in the gifted visual arts program at Virginia Beach Middle School (VBMS), selected Pignaloso as the recipient of her teacher-inspired artwork, one of the final assignments for eighth-graders in the program. 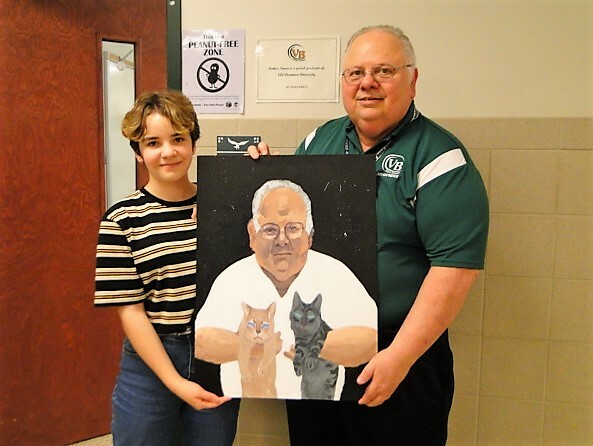 “It’s a piece students create to honor a teacher who has made an impact or a difference in their time here at VB Middle,” explained VBMS art teacher Anne Baker. And the recipients are so grateful for the thoughtful gift. To better understand what may be meaningful to their selected teachers, the student artists interview them in addition to reflecting on what makes the teachers special to them. Providing a listening ear is what has made VBMS School Counselor Kasey Lahousse a special person to Alyssa Serrano. Serrano said it made her feel “really happy” to present the gift to Lahousse “because she gave me something so I wanted to give her something in return.” The painting incorporated Lahousse’s favorite animal, favorite color and favorite flowers – one flower from where she used to live (Japan) and one from where she will be moving after this school year (Hawaii). According to Lahousse, who said she loved the very personal artwork, Serrano gave her an even greater gift. 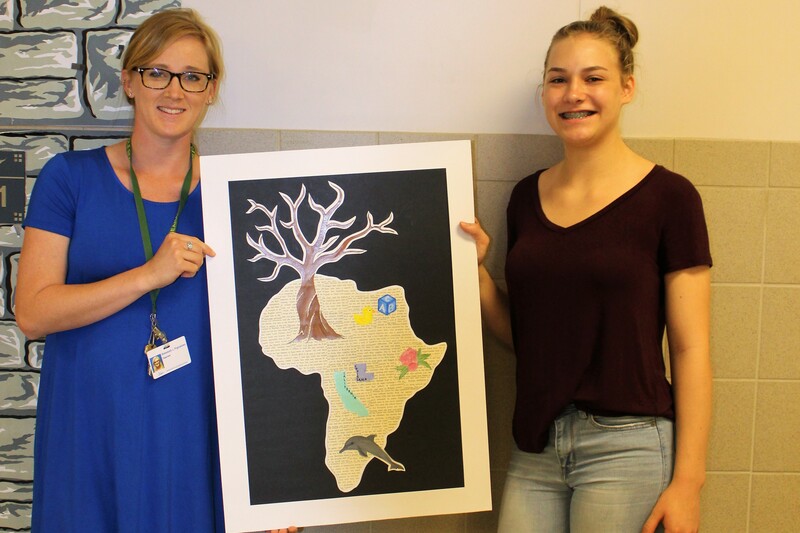 Mutual admiration is also evident in the collaborative piece created by eighth-grader Madison Washington and her art teacher, Leah Krueger. 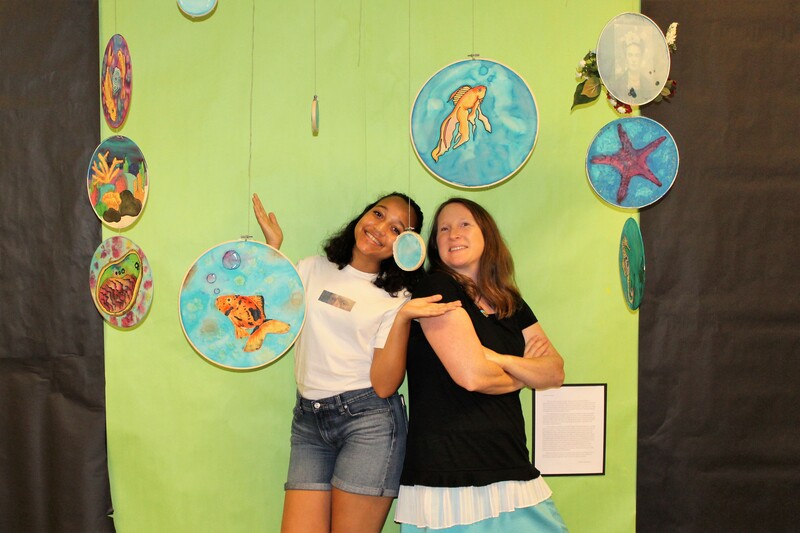 The unique installation features circular silk paintings of fish, coral, shells and other items that represent various symbols between the student and teacher. Painting on silk, Krueger’s favorite, was new to Washington and provided an opportunity for her to further grow as an artist while creating a meaningful piece with her teacher. Krueger has equally positive feelings about Washington. 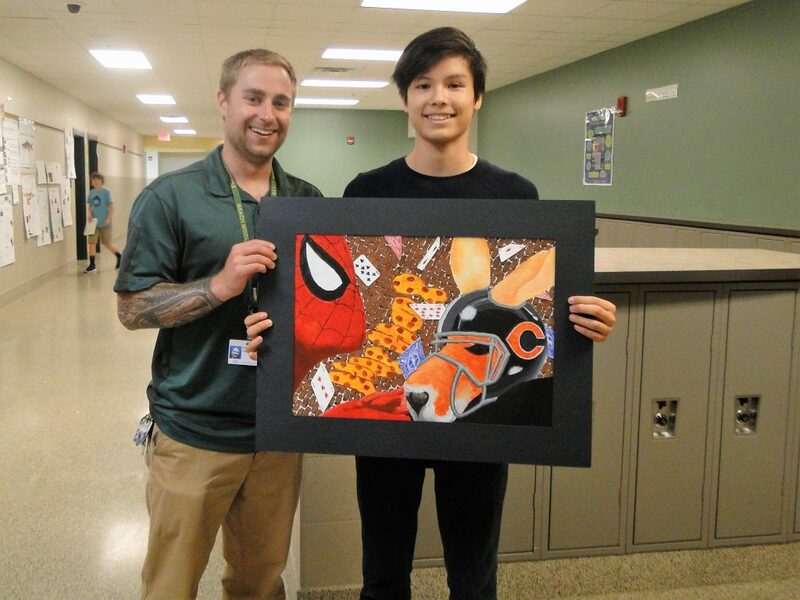 While some students, like Washington, honored teachers they have known for their entire middle school career, other students’ pieces show that teachers can make a positive impact in a short amount of time. 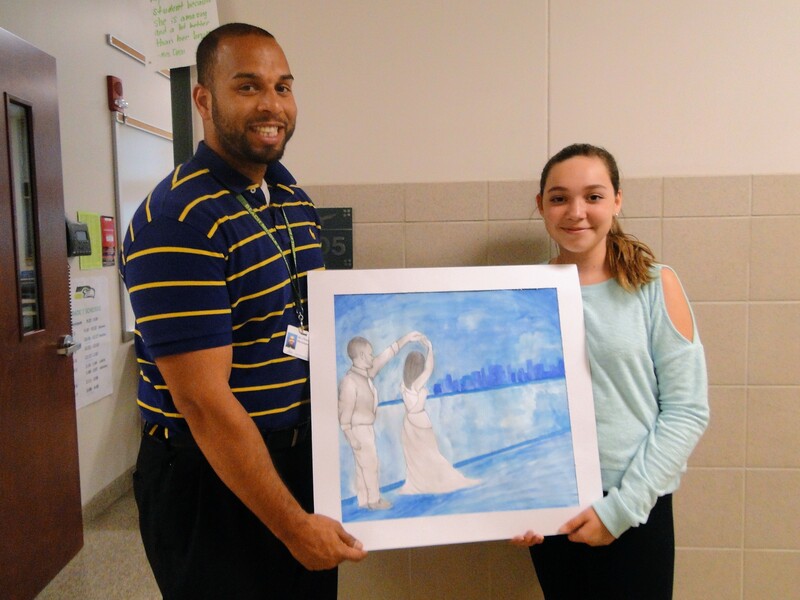 Nina Wilson created artwork to honor Lateesha Green, a long-term substitute teacher for Wilson’s social studies class. 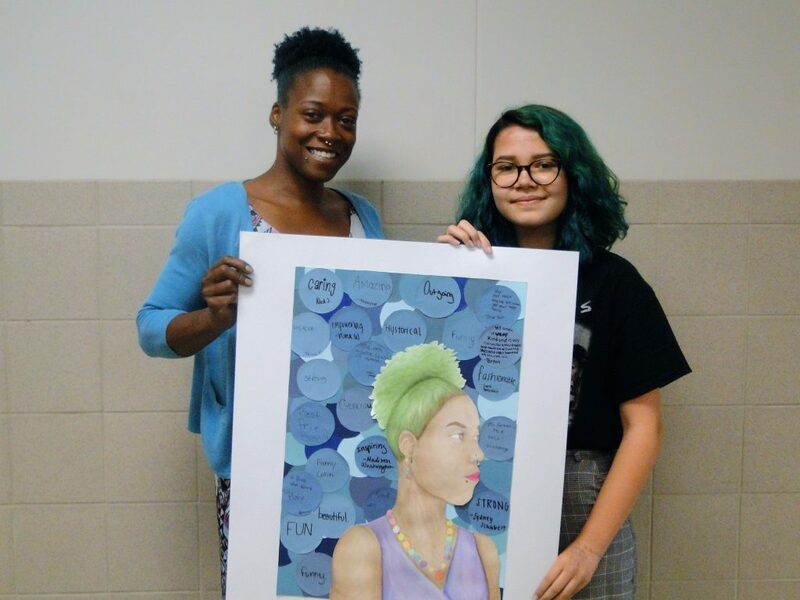 The piece includes a profile portrait of Green surrounded by blue circles that include classmates’ handwritten words to describe her: strong, fun, fashionable, inspiring, outgoing, caring, empowering. York used a reference photo from Roane’s wedding day to illustrate a memorable dance on a cruise ship overlooking the Miami skyline. “He said one of the most important things to him is his family and his wife, and this was an important day to him,” York explained. 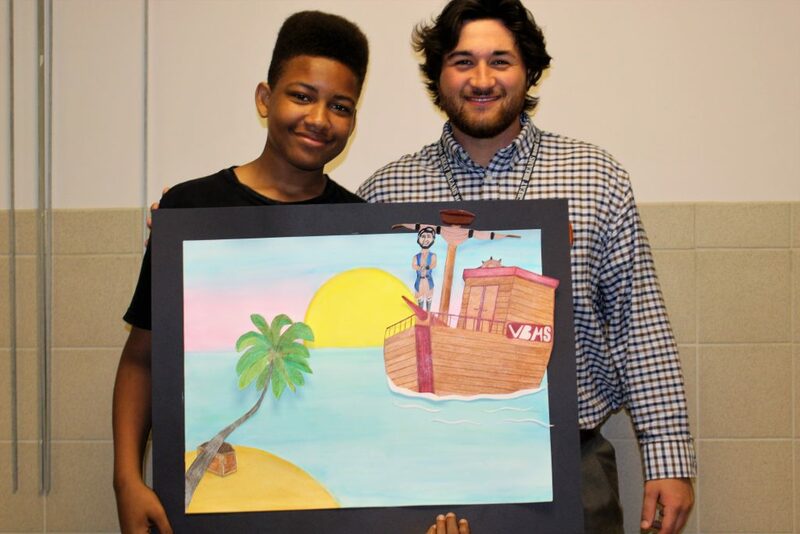 Eighth-grader Nick Samuels also used a ship – a pirate ship – in his artwork for first-year teacher Dakota Harmon. The pirate standing on the ship’s bow is on a quest for a treasure chest full of coffee – a beverage Harmon talks about regularly, according to Samuels. The student artist was also mindful of the fact that Harmon is new to the profession. “I thought it would be cool to do this one for him especially since it’s his first year. I just wanted it to be kind of like a welcome gift for him,” said Samuels. While Harmon concludes his first year, Arthur Simon is wrapping up his final year teaching and Serenity Steet wanted to honor him. Steet painted a portrait of Simon holding two of his cats, who she said have featured prominently in many class stories. The math teacher also has told students about his career in the Navy, which inspired the background of Steet’s painting. “It might be hard to tell, but I put stars [in the background], and I put the reflection of the stars in his glasses to represent how when he was in the Navy, he was the only one who knew how to navigate using the stars,” Steet said. Like the stars in Steet’s piece, Caillou Denton paid attention to details in the multimedia piece he created for eighth-grade math teacher Austin Mehl. “Since his favorite animal is a kangaroo, I just combined his favorite football team with a kangaroo and made him a character,” said Denton while placing the final handmade playing card on the artwork to represent Mehl’s favorite game, 21. More favorites – Spiderman and hip hop – are also featured. Mehl said he wanted to honor Denton because, “He has the most understanding personality.” Additionally, according to Denton, Mehl always answers his questions and shows a calm demeanor in class. 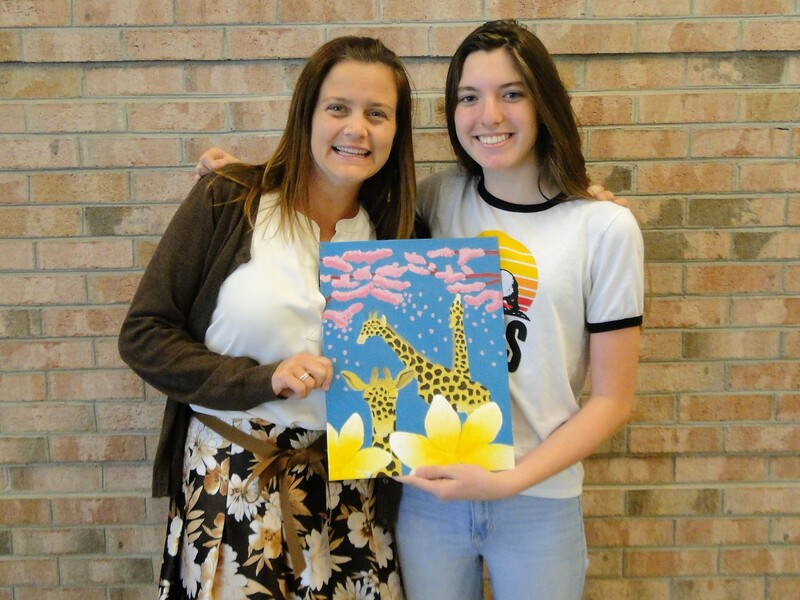 While the teachers who receive artwork feel honored to be acknowledged by students, it also makes a lasting impression on the students who leave this artwork behind as they transition to high school.